"Russian Bare in Formation over the Adelaide Hills"
This image taken by Jana Fitzpatrick really captures the essence of the aviation theme we love. The Russian Bare flies in loose formation with our camera ship on route to an aerobatic competition day. While we were not competing ourselves it was a very enjoyable day to spectate, support those that had planned the day and enjoy the company of other aviators. 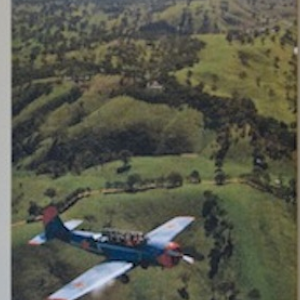 We think this piece will compliment any household with a love of the Adelaide Hills, and with this aviation twist you`ll be guaranteed a conversation starter. Image printed on canvas and framed. These images are printed on a 440 gsm Textile/ Artistic Canvas using waterproof Eco Sol long lasting UV stable inks. Image size 450 x 300mm. Framed on a premium 42 x 19 mm New Zealand pine. 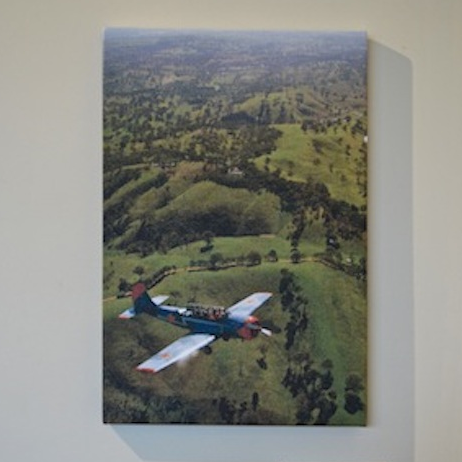 Canvas is stretched onto frame and stapled onto the rear and covered with a 40mm wide strip of black felt for presentation and surface protection.